When Sisimiut airport was established in 1998 the road was build and this make the visit to the culture-historically Asummiut much more easy. On Asummiut and in the area surrounding the airport you will find marks of a culture history which dates back more than 4000 years. The untrained eye may find it somewhat difficult to see some of the culture-historical monuments of the past which are mentioned in this page. However, when you finally have found them and you look at one of the culture-historical monuments, it does not require much fantasy to imagine the former life of these Places. And this makes the trip worthwhile. When you visit the culture-historical monuments, please remember that they are scheduled and must not be disturbed. Thus, it is illegal to remove anything from the culture-historical monuments. It is neither allowed to walk on or lit a fire close to the monuments. Stragners may find the name Asummuit all Greenlandic, however, the name sounds wrong to the Greenlanders. There is some uncertainty as to the origin of the Word, however, some people say as follows: “Previously, the people living on Asummiut were called Assumiut but the Danes pronounced the Word incorrectly, i.e. Asummiut, and the wrong Word was put on the map. Therefore, everybody calls the place Asummiut”. Assumiut means “Those who live by the adverse wind”. In Danish the Asummiut area is often called old Holsteinsborg “Gamle Holsteinsborg”. However, this is wrong from historical point of view. The colony Holsteinsborg was established by the Danes in 1756. The original position of Holsteinsborg was by the place called Ukiivik (South Bay) which was 40 kilometres North of its present position. In 1764, the colony was moved from Ukiivik to where Sisimiut is situated today. After 1764, the area of Holsteinsborg’s initial position (In Ukiivik) was often called old Holsteinsborg “Gamle Holsteinsborg”. Since the 1950’s, this name has, however, also been used in connection with Asummiut. The confusion is due to the fact that the missionary of the colony Holsteinsborg actually lived by Asummiut during the period 1763-1767. On your way out to Asummiut and the airport there will be plenty of opportunity to enjoy nature and look at the geology. The hillsides north of “Ulkebugten” along the way to the airport give a very nive impression os the Sisimiut area’s geological history which is charactarised by an extremely folded and raised seabed. This appears as distincly moulded formations in the hills. The ice masses of later periods have scored heavily across the hills. The last 4000 years, the land around Sisimiut has arised by 15 to 20 metres. Along the road there will also be a chance to see a few culture-historical attractions. On the right side approx two kilometres along the road – 10 metres from the road – you will find the rest of a fox trap of a more recent time. The trap is situated on a ledge under an inclined rock projection. Immediately afterwards, alongside the road on your left side down the beach, you will see a small peat wall site. It could be a site from the Thule culture, which means that it may be 400-600 years old. After approx. three kilometres, the road makes a sharp turn along the inside a beautiful snad beach. Right after passing the beach, the road crosses a river. Thanks to the road it is now common to go out and fetch the clearest and purest water of the hill during the summer. From this point the Palasip Qaqqaa Hike can be started. Read the Palasip Qaqqaa Hiking Guide here. On Asummiut there is a descent slope to the plain next to which a board is erected which contains brief information on the various culture-historical monuments by Asummiut. The first thing that cathes the eye is the charactaristic peat wall. Untill recently, the common impression was that during the 18th century this wall surrounded the building which houses the former Sisimiut Tourist Information (now a part of Sisimiut Museum). We know that this house was moved from Asummiut to its present position in 1767. However, mmeasurements shows that the peat wall does not hold the same measurements as the house. Therefore, it cannot have been the wall surrounding the house in question. However, the peat wall looks like the peat walls of Nipisat (south of Sisimiut). It is a fact that the peat wall by Nipisat is the remainder of a large warehaouse from the 18th century. Therefore, it is vey likely that the significant peat wall of Asummiut is some of the remainders of a warehouse too. Just like today, people of the 18th century also depended very much on the provisions and material which were delivered by ship from Denmark. Thus, it was also important back then to have proper warehouses. In a diary from the 1760’s a so-called blubber house on Asummiut is mentioned. It is probably the remainders of the peat wall around this blubber house which is now the landmark of Asummiut. Further to the south of the Asummiut plain you will find a site from a European house. Here, measurements have shoen that the foundation stones which lie in the soil around this site holds exactly the same measurements as the above-mentioned building which now are a part of Sisimiut Museum. Among other things the house is called Glahn’s house. This is due to the fact that the name of the missionary who lived in the house when it was situated on Asummiut was Christoffer Glahn. Furthermore, it is in his diaries which are preserved and which contain a lot of information on the life of both the European and Greenlanders in Sisimiut in the 1760’s. Even further to the southwest out by the sea you will find clear remainders from a typical long house from the Thule culture. The house has probably been occupied during the 18th century. In connection with this logn house you may be lucky enough to find a meat cache where the occupiers probably stored up some of their winter supply 300 years ago. If you go back to the significant peat wall and a little further you will reach an area where the whole hillside is filled with sites. All in all you will find 11 preserved sites. They all originate from the winter houses of the Thule culture. 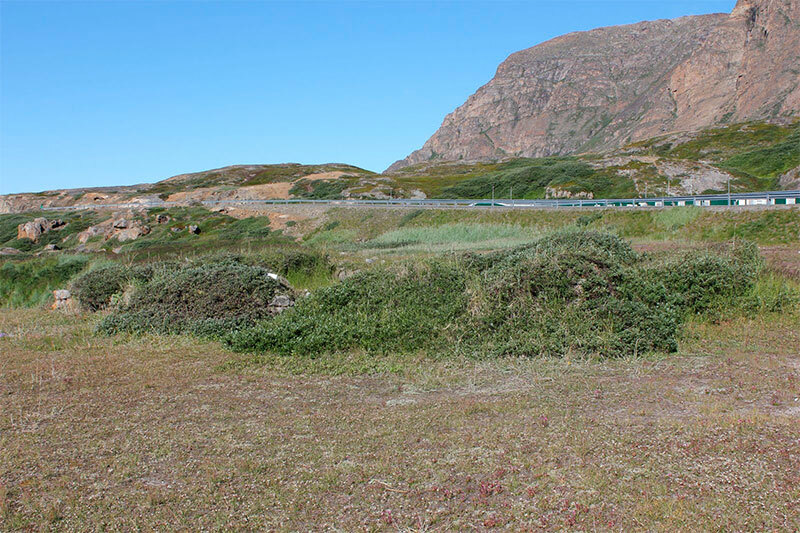 The oldest site have been dated to the 13th century due to their shape and thus originate from a period where the people of the Thule culture appeared in the Sisimiut area for the first time. The latest site originates from the 18th century. Therefore, it have probably been occupied at the same time as Missionary Clahn lived in Asummiut as we know from Glanh’s diaries that he was not alone on Asummiut in the 1760’s. There also lived Greenlanders on Asummiut back then. In connection with the establishment of the airport the archaeologists were busy checking the total area. Among other thing, a wealthy Saqqaq village was dug up on the raised beach just before the airport on the side of the road pointing of the airport. At the actual spot there is not much to see, however, some of the results are included in the culture-historical wall picture exchibition in the building of the airport. The exhibition outlines parts of the area’s culture history. Thus, the exhibition in the building of the airport may be a good place to start a one day inspection of the Asummiut area.